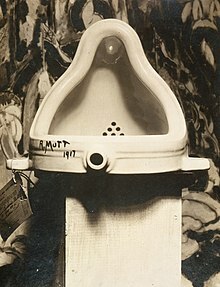 In 1961 the term "concept art", coined by the artist Henry Flynt in his article bearing the term as its title, appeared in a proto-Fluxus publication An Anthology of Chance Operations. However, it assumed a different meaning when employed by Joseph Kosuth and by the English Art and Language group, who discarded the conventional art object in favour of a documented critical inquiry, that began in Art-Language The Journal of conceptual art in 1969, into the artist's social, philosophical, and psychological status. By the mid-1970s they had produced publications, indices, performances, texts and paintings to this end. In 1970 Conceptual Art and Conceptual Aspects, the first dedicated conceptual-art exhibition, took place at the New York Cultural Center. ^ "Ed Ruscha and Photography". The Art Institute of Chicago. 1 March – 1 June 2008. Archived from the original on 31 May 2010. Retrieved 14 September 2010. Shellekens, Elisabet. "Conceptual Art". In Zalta, Edward N. (ed.). Stanford Encyclopedia of Philosophy.